I can’t believe I’m saying this, but it’s been nice to have a full week that wasn’t dictated by powder skiing. Not that I would mind doing that again… and again. Still, there was much to be done work-wise, workout-wise, around the house, and socially. The sunny and calm weather made that especially pleasant. 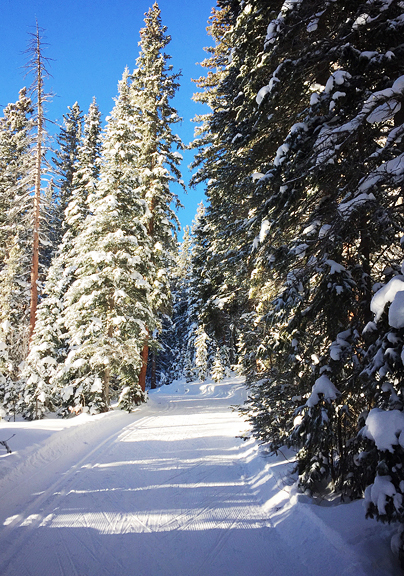 Jeremy and I love to get an early morning skate ski to jumpstart the particularly busy days. 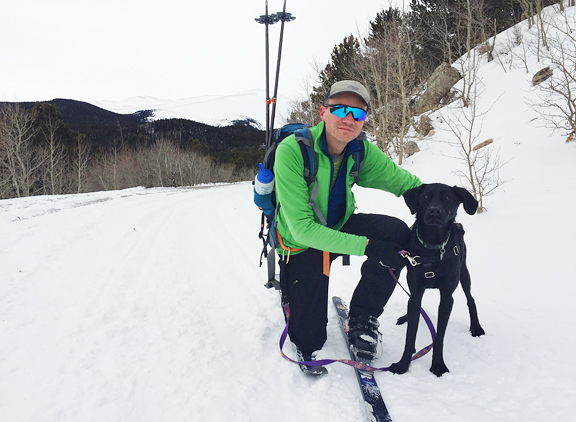 On the less intense work days, we’ll take Neva with us for a little backcountry touring and to change up the exercise. We invited our neighbors over for wine and appetizers and to chat with their graduating senior about career and school options. We worked through the weekend, taking a break to ski and think in the backcountry and come up with a plan of action for things that are important to us (climate, science, public lands, the environment, social justice, education, equal rights, diversity, to name a few) and meeting up with some old and new friends. 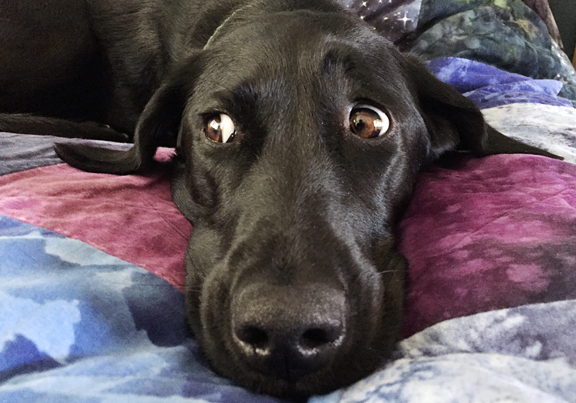 Chinese New Year is this coming Saturday, which means I have less than a week to clean the house, make tons of traditional Chinese foods, and freak myself out over the superstitions that I know aren’t really real. It’s going to be the Year of the Rooster. My Grandma was a rooster. She would have turned 96 this year. I don’t have anything profound to say. I simply miss her kind and gentle soul, and her wisdom. It feels that we could use all the kindness and wisdom we can muster. Today’s recipe is another Chinese favorite from my childhood. But it wasn’t my favorite, it was my sister, Kris’, favorite. Whenever we went to dim sum, the sesame balls (jian diu) would catch her eye as the ladies wheeled the carts past. These fried mochi dough balls covered in sesame seeds and filled with a sweet center were crispy outside and chewy and warm inside (when fresh). 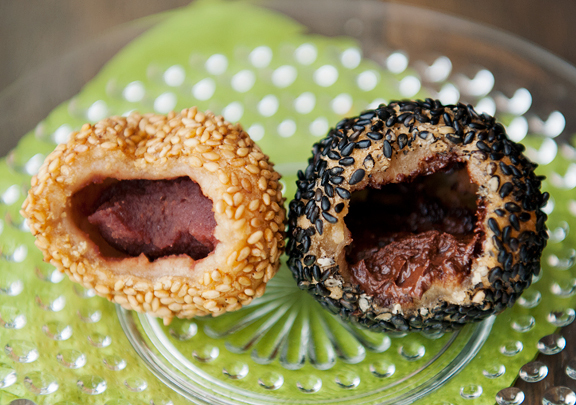 If I had to choose a filling, it would always be sweet red bean (azuki), but they were filled with sweet date, lotus seed, sesame seed paste, peanut, mung bean. I thought it was time to tackle this recipe – not for me so much as to honor my memory of Kris. I say it every time, but it’s worth repeating: glutinous rice flour does not contain gluten. It’s called glutinous because sweet rice flour is sticky as hell. So this recipe is in fact, gluten-free in case you were concerned. Now the quantities in the photos don’t reflect the exact quantities in the recipe below because I didn’t like how this first recipe turned out. But they are very similar and the steps are nearly identical. The glutinous rice flour has interesting properties. I haven’t worked with it nearly as much as I have worked with wheat flour, but it’s safe to say that they behave differently. When you stir the water into the glutinous rice flour, they seem to remain separated as if they were oil and water. But then after several seconds of what seems like pointless stirring, the flour suddenly absorbs the liquid and forms a dough. But it isn’t an elastic dough, it’s a brittle dough. Pull it apart and it breaks rather than stretches. But leave it be for a few seconds and it behaves like the Earth’s mantle, slowly flowing as a viscous liquid. So when you handle the dough, don’t fret too much if it breaks, just gently press it together and it will mend. Neat, huh? Make sure none of the filling oozes out or your fry session will become a sputtering mess. 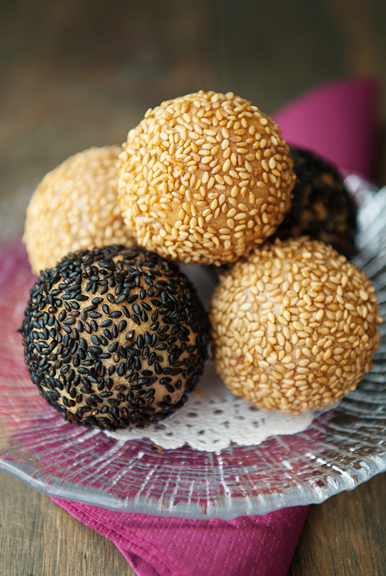 Once the balls are filled, dip each one in water and shake off the excess, then roll it in sesame seeds. 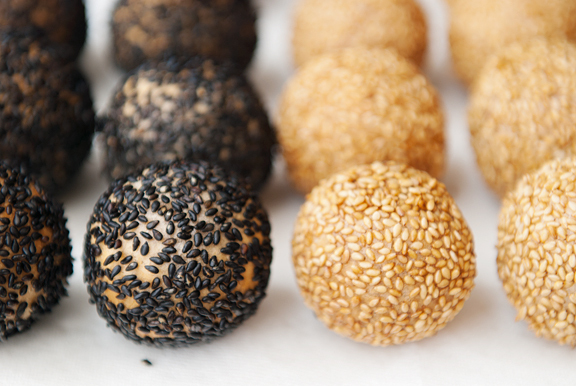 I rolled the traditional red bean balls in white sesame seeds and the chocolate balls in black sesame seeds. I only had a small amount of raw white sesame seeds, but a ton of toasted white sesame seeds. It doesn’t make much difference between raw and toasted because they all wind up fried and golden in the end. So the trick to frying these guys is to make sure your oil temperature is correct. Most of what I fry is quite forgiving on the oil temperature, but for these sesame balls, I do recommend using a candy thermometer to monitor the temperature. Nominally 350°F works at sea level. For those of us at higher elevations, the general rule is to reduce the target temperature by 1 degree for every 500 feet above sea level. 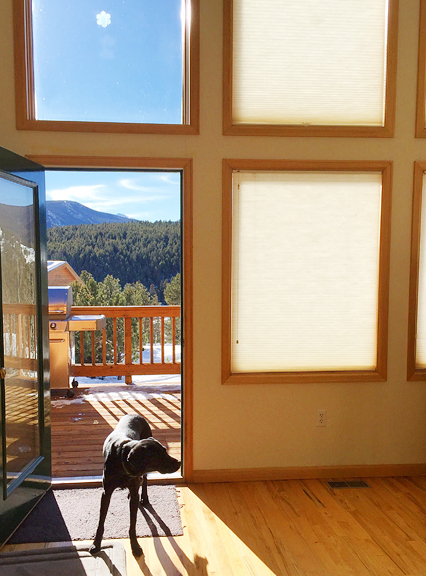 At 8500 feet, my target temperature was 333°F. The reason I know this is because the first time I made these sesame balls, 350°F was too hot and the outsides fried rock hard, not allowing the insides to expand, so they remained on the bottom of the pan and I wound up with dense, inedible bricks. The second time around, I reduced my temperature accordingly and the sesame balls floated to the top after about 4-5 minutes of frying because the balls expand from the heated air inside. You’ll have to turn them in the oil to ensure even cooking and to avoid any differentials in pressure resulting in a busted side that leaks filling into the hot oil and lots of violent splattering. Be sure to allow the sesame balls to cook long enough so the dough is chewy, but not so long that they burst. We’re talking 5-7 minutes and you may have to cut one open to gauge the doneness. The sesame balls came out better than I was expecting, especially after the first fiasco. The outside is crunchy, but yields when you bite and sink your teeth into the soft and chewy mochi layer. My favorite is still the red bean filling, but Jeremy was partial to the chocolate (naturally). These are best served hot or warm. Once cold, the mochi shell becomes dense and not as pleasant to chew. Also, the chocolate center cools and hardens. 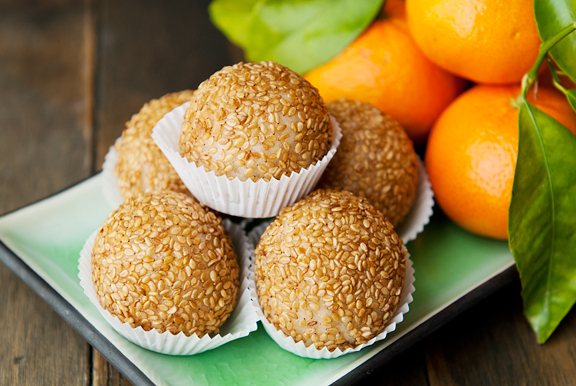 For leftover sesame balls, you can pop them in the microwave for 15-20 seconds. We basically watch them begin to expand and take them out before they blow up. The outer shell is no longer crisp at that point, but the rest of it is serviceable. 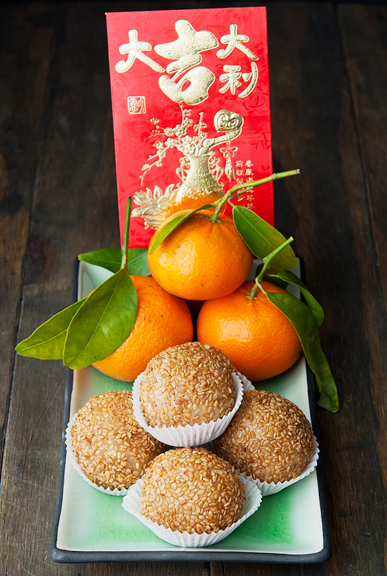 So if you’re looking for a good recipe for the Lunar New Year, this is a great project because they are sweet (eat something sweet first thing on New Year’s Day), round (round is good luck), and delicious! Place the glutinous rice flour in a large mixing bowl. 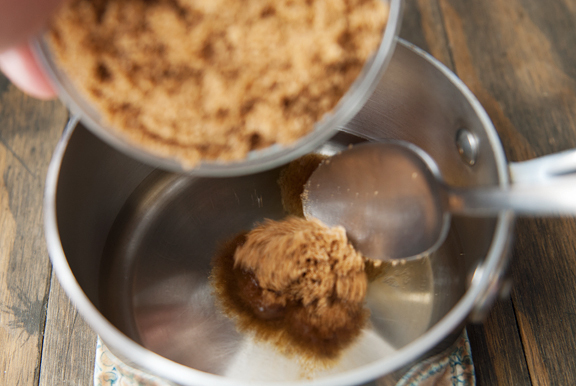 Stir the dark brown sugar and the water together until the sugar is completely dissolved. Stir the water into the flour. 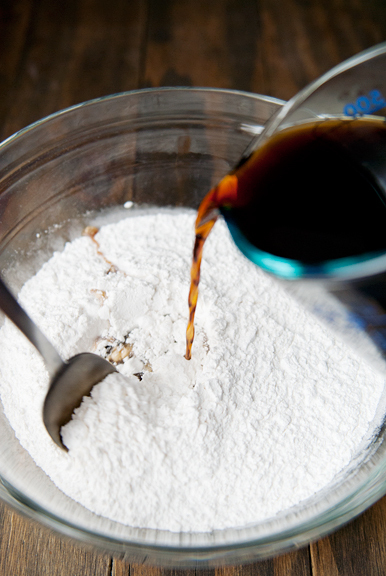 At first it won’t really mix, then the flour will suddenly absorb the liquid. Just keep at it until it comes together. When stirring no longer mixes the dough, knead it for a minute or so until the dough is soft, smooth, and just slightly tacky, but not sticky. If the dough is too dry, add a tiny bit of water and knead it in and repeat until you get the right consistency. 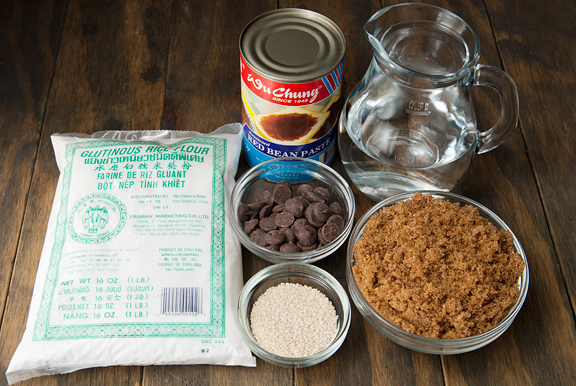 If using red bean paste, roll about 20 or more teaspoon-sized balls and set aside. Roll the dough out into a log and cut it into 20 equal pieces or pull off golf-ball sized pieces and roll each one into a ball. 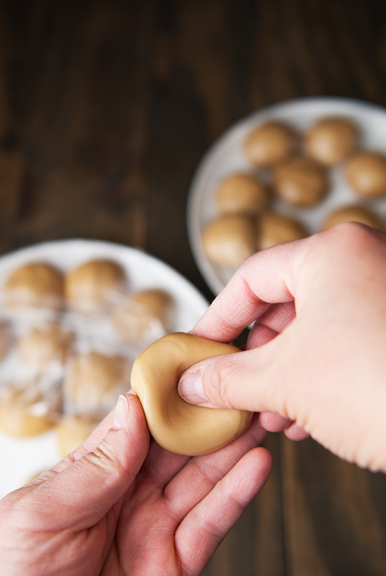 Keeping the balls of dough under plastic (to prevent drying), work with one ball at a time. 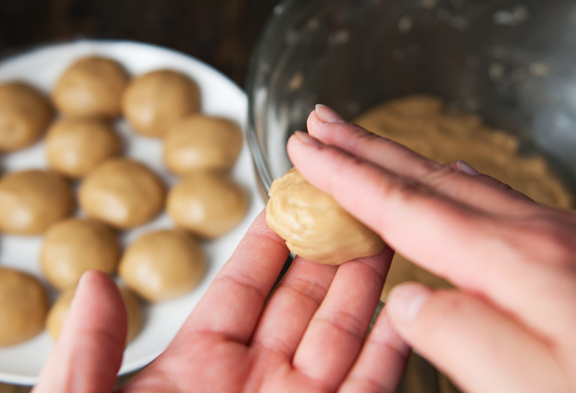 Make a well in the center of a dough ball with your thumb and pinch the sides up into a bowl. 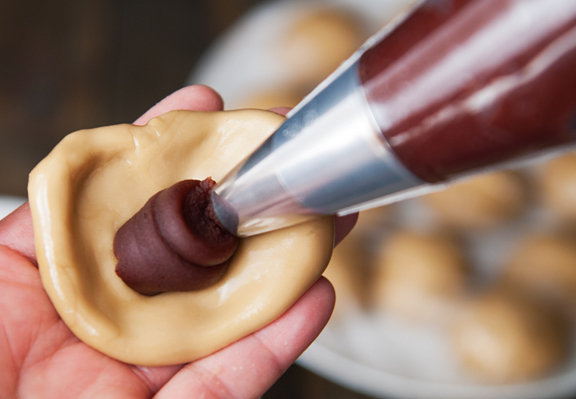 Set a ball of red bean paste or a teaspoon of chopped chocolate in the center of the dough. 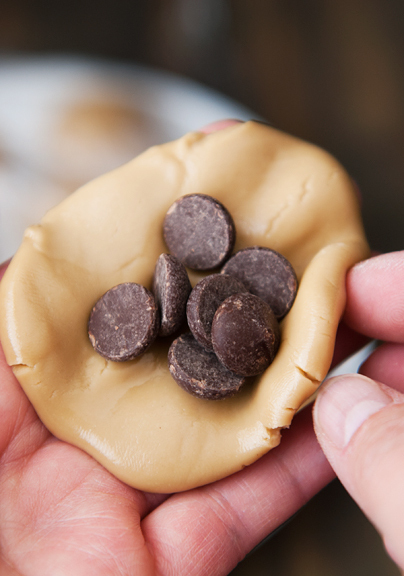 Fold the dough up around the filling, sealing any holes and pinching off any excess dough (flat circles don’t perfectly translate to the surface area of a sphere, so there will be overlap). Repeat for the rest of the dough balls. Heat 2 inches of vegetable oil in a pot over medium heat with a candy thermometer attached to the side. The target temperature is 350°F for sea level (subtract 1° for every 500 feet above sea level – so at 8500 feet, I subtract 17° from 350°F for my target temperature = 333°F). Place the sesame seeds in a small bowl. 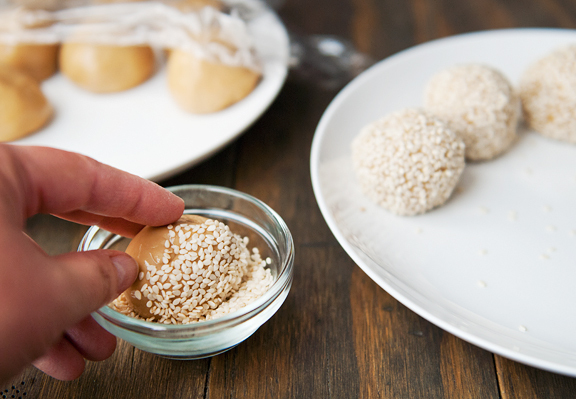 Dip a filled dough ball in water, shaking off excess, and then roll it in the sesame seeds until coated. Repeat for all of the balls. Carefully lower 4-5 balls into the hot oil, occasionally using a spoon to rotate the balls for even cooking. They should begin to float after 4 or so minutes of frying. Continue to rotate the balls to encourage even cooking for another minute. You may have to sacrifice one, by taking it out and cutting it open to see if the dough is cooked through. But you definitely don’t want to fry more than 6 to 7 minutes total, because they can explode and then the filling will spill out and the oil will being to boil like crazy. Remove the sesame balls to paper towels to drain. Serve hot as they are best fresh, but you can also reheat them for 20 seconds (keep an eye on them, they begin to expand very fast and can explode) in the microwave. Makes 20-24 sesame balls. just went to yum cha this morning! though i didn’t get these (completely forgot about them and was focused on the hom suey gok). i was irrationally surprised to see that you filled some with chocolate; i love the red bean and lotus paste filled ones so much that i didn’t even think about chocolate! Oh my gosh I have been waiting for you (as my go to for authentic Chinese recipes) to post this recipe since I found the recipe for char siu bao! Thank you! I will definitely be making these soon! Oh my gosh, I’m so excited that you posted this recipe. My first attempt at sesame balls did not go well, several years ago, and I was thinking to try them again for dessert on Saturday. They are one of my favorites when we go to dim sum! OH WoW! Thank you so much for this recipe!!! I have been wanting to make this for really long, long time but didn’t know how. Now I can…going to make it this weekend! Thanks so much, Jen! I’m seriously addicted to these!! When we order from the Japanese restaurant, I always order about 2 dozen. I have be trying to get the energy to make them myself, maybe with your recipe and I can do it. Would I be able to do them in an air fryer with a paddle? What a lovely way to honour your sister. Best wishes to you for a Happy New Year, dear Jen! heather – I never actually order them at dim sum because i’m such a savory girl! :) And the only reason I did the chocolate ones was because I figured those would be the only ones Jeremy would eat! Theresa E – Oh yes, I had that very problem the first time around. My temperature was too high so the outer shell fried into a hard surface and nothing could expand. Good thing they didn’t explode! Pey-Lih – You’re so welcome! Charlie Ralph – Sorry to answer this so late. I have never tried it with an air fryer and I’m not sure how well it would work (I am not familiar with air fryers). If it doesn’t work, have a pan and oil ready so you can fry them in the traditional way and not waste your efforts. 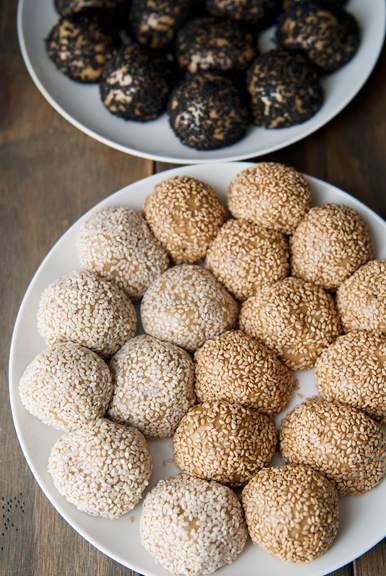 Kudos to you for making sesame balls! I love peanut ones. The place where I buy them from expands to a large and hollow ball with a very thin crust and a knob of fragrant peanut filling side. The chocolate ones are sure fusion! Was wondering which part of the recipe they will be used it until i read that you wrap some dough with chocolate. Lucky Jeremy!